Columnist Feature #5 – How fast are bats anyway? The bat maternity season certainly hasn’t kept us quiet on the Urban Bat Project Team, and now that the summer hiatus is over we can take a breath and look back at the summer’s fieldwork. 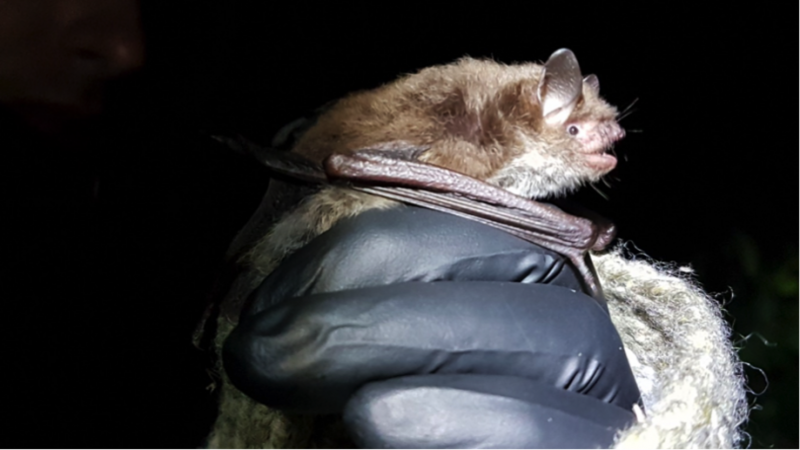 This has largely consisted of preparing for and then undertaking surveys along linear features, looking for evidence of which bat species are using which types of features to commute from their day roosts to their night feeding grounds. This has been made possible by Wildlife Acoustics Inc., from whom we have been awarded a Scientific Product Grant in the form of eight Echo Meter Touch 2 Pro (EMT2Pro) bat detectors for Android. I had designed the survey to utilise these detectors because they are full-spectrum, user-friendly and would enable us to have GPS-tagged and time-stamped data. 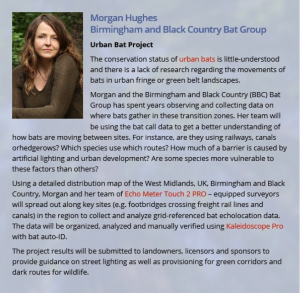 The idea is to spread out teams of recorders along a linear feature and (using both sound analysis and field observations) ‘follow’ the movement of individual bats as they passed each survey team. The survey has not been without its problems, and we have had to undergo a good deal of trouble-shooting, but I’m now delighted to say that all the kinks are ironed out and we’re gathering some useful data. Initially, we had some issues with the time stamps on the files, because although everyone using the EMT2Pro units on their phones had a data package and their phone was set to ‘auto update’ their time, the difference in time between any two phones could be out by up to 5 or 6 seconds. This is enough of a discrepancy to skew my data, and we had to find a workaround: we downloaded an app called ClockSync to see how far out each of our phones was from the Atomic Clock and (as suspected) there was a huge variation. Now we use the ClockSync app to manually calibrate our phones/tablets prior to the survey to within 0.5 seconds. …and it works. The green cells you can see in the spreadsheet above represent calls of Daubenton’s bats as they passed survey points Golf, Foxtrot and Echo – heading north at almost exactly 4.9mps. The distance between the survey points was measured, giving me estimated time factors, so that I would know what time stamp in the recordings to look for when searching for the travelling bat. It is early days, and I will be repeating the survey weekly for the rest of the summer, but preliminary observations have already identified a ‘hop-off’ point from the canal to a foraging ground, and we are getting strong data about directional travel for several species. I’m super-excited about the surveys, but for now I have to dust off the harp traps because trapping season starts tomorrow! See you in a month with another update! Header Image: Daubenton’s bat. Credit: Morgan Hughes.